Not to be confused with former Formula One team Frank Williams Racing Cars, formed by Frank Williams in 1967. Williams Grand Prix Engineering Limited, currently racing in Formula One as ROKiT Williams Racing, is a British Formula One motor racing team and constructor. It was founded by team owner Sir Frank Williams and automotive engineer Sir Patrick Head, it is still run by Williams. The team was formed in 1977 after Frank Williams's two earlier unsuccessful F1 operations: Frank Williams Racing Cars (1969 to 1975) and Wolf–Williams Racing (1976). All of Williams F1 chassis are called "FW" then a number, the FW being the initials of team owner, Frank Williams. The team's first race was the 1977 Spanish Grand Prix, where the new team ran a March chassis for Patrick Nève. Williams started manufacturing its own cars the following year, and Switzerland's Clay Regazzoni won Williams's first race at the 1979 British Grand Prix. At the 1997 British Grand Prix, Canadian Jacques Villeneuve scored the team's 100th race victory, making Williams one of only three teams in Formula One, alongside Ferrari and fellow British team McLaren, to win 100 races. Williams won nine Constructors' Championships between 1980 and 1997. This stood as a record until Ferrari surpassed it in 2000. Drivers for Williams have included Australia's Alan Jones; Finland's Keke Rosberg; Britain's Nigel Mansell, Damon Hill and Jenson Button; France's Alain Prost; Brazil's Nelson Piquet and Ayrton Senna; and Canada's Jacques Villeneuve. Each of these drivers, with the exception of Senna and Button, have captured one Drivers' title with the team. Of those who have won the championship with Williams, only Jones, Rosberg and Villeneuve actually defended their title while still with the team. Piquet moved to Lotus after winning the 1987 championship, Mansell moved to the American-based Indy Cars after winning the 1992 championship, Prost retired from racing after his 4th World Championship in 1993, while Hill moved to Arrows after winning in 1996. No driver who has won a drivers' title with Williams has managed to win a title again. Williams have worked with many engine manufacturers, most successfully with Renault, winning five of their nine Constructors' titles with the French company. Along with Ferrari, McLaren, Benetton and Renault, Williams is one of a group of five teams that won every Constructors' Championship between 1979 and 2008 and every Drivers' Championship from 1984 to 2008. Williams F1 also has business interests beyond Formula One racing. Based in Grove, Oxfordshire, UK, Williams has established Williams Advanced Engineering and Williams Hybrid Power which take technology originally developed for Formula One and adapt it for commercial applications. In April 2014, Williams Hybrid Power were sold to GKN. Williams Advanced Engineering had a technology centre in Qatar until it was closed in 2014. Frank Williams started the current Williams team in 1977 after his previous outfit, Frank Williams Racing Cars, failed to achieve the success he desired. Despite the promise of a new owner, Canadian millionaire Walter Wolf, and the team's rebranding as Wolf–Williams Racing in 1976, the cars were not competitive. Eventually Williams left the rechristened Walter Wolf Racing and moved to Didcot to rebuild his team as "Williams Grand Prix Engineering". Frank recruited young engineer Patrick Head to work for the team, creating the "Williams–Head" partnership. Reuters reported on 20 November 2009 that Williams and Patrick Head had sold a minority stake in the team to an investment company led by Austrian Toto Wolff who said that it was purely a commercial decision. In February 2011, Williams F1 announced plans to raise capital through an initial public offering (IPO) on the Frankfurt Stock Exchange (FWB) in March 2011, with Sir Frank Williams remaining the majority shareholder and team principal after the IPO. As of December 2017, ownership is as follows: Frank Williams (51.3%); Brad Hollinger (11.7%); Patrick Head (9.3%); 24.1% on the public market place; and 3.6% is held by the trust fund employee. Williams entered a custom March 761 for the 1977 season. Lone driver Patrick Nève appeared at 11 races that year, starting with the Spanish Grand Prix. The new team failed to score a point, achieving a best finish of 7th at the Italian Grand Prix. For the 1978 season, Patrick Head designed his first Williams car: the FW06. Williams signed Australian Alan Jones, who had won the Austrian Grand Prix the previous season for a devastated Shadow team following the death of their lead driver, Tom Pryce. Jones's first race for the team was the Argentine Grand Prix where he qualified the lone Williams car in 14th position, but retired after 36 laps with a fuel system failure. The team scored its first championship points two rounds later at the South African Grand Prix when Jones finished fourth. Williams managed their first podium position at the United States Grand Prix, where the Australian came second, some 20 seconds behind the Ferrari of future Williams driver Carlos Reutemann. Williams ended the season in tenth place in the Constructors' Championship, with a respectable 16 points, while Alan Jones finished 12th in the Drivers' Championship. Towards the end of 1978 Frank Williams recruited Frank Dernie to join Patrick Head in the design office. Head designed the FW07 for the 1979 season with Frank Dernie picking up the aerodynamic development and skirt design. This was the team's first ground effect car, a technology first introduced by Colin Chapman and Team Lotus. Williams also obtained membership of the Formula One Constructors' Association (FOCA) which expressed a preference for teams to run two cars, so Jones was partnered by Swiss driver Clay Regazzoni. It was not until the seventh round of the championship, the Monaco Grand Prix, that they achieved a points-scoring position. Regazzoni came close to taking the team's first win but finished second, less than a second behind race winner Jody Scheckter. The next round at Dijon is remembered for the final lap battle between René Arnoux and Gilles Villeneuve, but also saw both cars finish in the points for the first time; Jones was fourth with Regazzoni sixth. The team's first win came at the British Grand Prix – their home Grand Prix – when Regazzoni finished almost 25 seconds ahead of anyone else. Greater successes followed when Williams cars finished first and second at the next round in Hockenheim, Alan Jones two seconds ahead of Regazzoni. Jones then made it three wins in a row at the Österreichring, finishing half a minute ahead of Gilles Villeneuve's Ferrari. Three wins in a row became four wins two weeks later at Zandvoort, Alan Jones winning again by a comfortable margin over Jody Scheckter's Ferrari. Scheckter ended the Williams winning streak when he won Ferrari's home Italian Grand Prix, Regazzoni finishing third behind both Ferraris. Alan Jones managed another win at the penultimate race at Montreal to cap off a great season. Williams had greatly improved their Constructors' Championship position, finishing eight places higher than the previous year and scoring 59 more points. Alan Jones was the closest driver to the Ferrari duo of Villeneuve and 1979 champion Jody Scheckter; Jones scored 43 points, 17 behind Scheckter, while Jones's teammate, Regazzoni, was two places behind him with 32 points. During the 1980 season, Alan Jones partnered with the Argentine Carlos Reutemann. The team started well in the championship, with Jones winning the first round of the season in Argentina. Jones won four more races: Paul Ricard, Brands Hatch, Montreal and the final round at Watkins Glen. Jones became the first of seven Williams drivers to win the Drivers' Championship, 17 points ahead of Nelson Piquet's Brabham. Williams also won its first Constructors' Championship, scoring 120 points, almost twice as many as second-placed Ligier. The duo won four races for the Williams team in the 1981 season. Alan Jones won at the first round at Long Beach and the final round at Las Vegas, while Carlos Reutemann won at the second round at Jacarepaguá and the fifth round at Zolder. Williams won the Constructors' title for the second year running, scoring 95 points, 34 points more than second-placed Brabham. Alan Jones retired from Formula One (though he would come back a year later for a single race with the Arrows team). The Australian was replaced by Finnish driver, Keke Rosberg, who had not scored a single championship point the previous year. He won the Drivers' title that year despite winning only one race, the Swiss Grand Prix at Dijon-Prenois. Rosberg's teammate, Reutemann, finished in 15th place having quit Formula One after just two races of the new season. His seat was filled by Mario Andretti for the US Grand Prix West before Derek Daly took over for the rest of the year. The Williams team finished fourth in the Constructors' Championship that year, 16 points behind first-place Ferrari. By the end of the season, Frank Williams realised that to compete at the top levels of Formula One he needed the support of a major manufacturer, such as Renault or BMW who could supply his team with a turbocharged engine. Frank Williams looked towards Honda, which was developing its own turbocharged V6 engine with the Spirit team. A deal between Honda and Williams was finally settled early in 1983 and the team used the engines for the 1984 season. Until then, for the 1983 season, Williams continued to use the Ford engine except for the last race of the year in South Africa where Keke Rosberg scored an encouraging fifth place. The team finished fourth in the Constructors' Championship, scoring 36 points, including a win for Rosberg at the Monaco Grand Prix. For the 1984 season, Head designed the ungainly FW09. Keke Rosberg won the Dallas Grand Prix and managed to get second at the opening race in Brazil. Rosberg's teammate, Jacques Laffite, came 14th in the Drivers' Championship with five points. The team finished sixth with 25.5 points, with Rosberg eighth in the Drivers' Championship. In 1985, Head designed the FW10, the team's first chassis to employ the carbon-fibre composite technology pioneered by the McLaren team. British driver Nigel Mansell joined the team to partner Rosberg. The team scored four wins with Rosberg winning in Detroit and Adelaide, and Mansell taking the European Grand Prix and the South African Grand Prix. Williams finished third in the Constructors' Championship, scoring 71 points. During qualifying for the British Grand Prix at Silverstone, Rosberg lapped the ultra fast 4.719 km (2.932 mi) circuit in 1:05.591 for an average speed of 160.938 mph (259.005 km/h), the fastest recorded lap in Formula One history to that point. 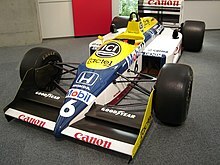 From 1985 until the end of the 1993 season, Williams cars ran with the yellow, blue and white Canon livery. In March 1986, Frank Williams faced the most serious challenge of his life. While returning to the airport at Nice, France, after pre-season testing at Paul Ricard, he was involved in a road accident which left him paralysed. He did not return to the pit lane for almost a year. Despite the lack of his trackside presence, the Williams team won nine Grands Prix and the Constructors' Championship and came close to winning the Drivers' Championship with Nigel Mansell, but the British driver's left-rear tyre blew at the Australian Grand Prix, the final round of the season, while his fellow championship rival and teammate, Nelson Piquet made a pitstop shortly after Mansell's retirement as a precaution. This left Alain Prost to defend his title successfully, despite being in an inferior car. The 1987 season brought the Williams-Honda partnership its first and only Drivers' Championship title in the hands of Nelson Piquet. Piquet won three races and scored 76 points – 73 after dropped scores (best eleven results counted) in relation to the Drivers' Championship. His teammate Mansell was in second place with six victories and 61 points for the season. The Williams team won the Constructors' Championship for the second year running, scoring 137 points, 61 points ahead of their nearest rivals, McLaren. Despite this success, Honda ended their partnership with Williams at the end of the year in favour of McLaren and continuing with Lotus. 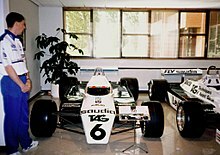 Unable to make a deal with another major engine manufacturer, Williams used naturally aspirated Judd engines for the 1988 season. This left them with a significant performance deficit compared with their turbo-powered rivals. Piquet left Williams to join Lotus who had retained their Honda engines for the 1988 season, helped by having Satoru Nakajima as number 2 driver to Piquet. Williams brought in Italian Riccardo Patrese to replace Piquet. The team did not win a race that season and finished seventh in the Constructors' Championship, scoring 20 points. The highlights of the season were two second-places by Mansell, at the British and Spanish Grands Prix. When Mansell was forced to miss two races due to illness, he was replaced by Martin Brundle and then Jean-Louis Schlesser. The team secured an engine supply from Renault in 1989. Renault engines subsequently powered Williams drivers to another four Drivers' and five Constructors' Championships up until Renault's departure from Formula One at the end of 1997. The combination of Renault's powerful engine and Adrian Newey's design expertise led to a particularly dominant period in the mid-1990s. Mansell had a record-breaking 1992 season, winning the title in record time and leading many races from pole to finish. Some maintain that the Williams FW14B and FW15C were "the most technologically advanced cars that will ever race in Formula One". The Renault era started in 1989, with Italian Riccardo Patrese and Belgian Thierry Boutsen at the helm of the two Williams cars. Boutsen replaced Mansell, who had signed on to be Gerhard Berger's teammate at Ferrari. The engine's first Grand Prix in Brazil was one that the team preferred to forget: Boutsen retired with an engine failure and Patrese with an alternator failure after leading, although Patrese did qualify second. The Williams Renault team managed to get back on track with Boutsen coming fourth in the next race at Imola, earning the team three points in their championship campaign. Two races later at the Mexican Grand Prix, the team managed to achieve their first podium with the Renault engine, as Patrese finished second, 15 seconds behind Ayrton Senna. The next race saw Patrese finish second again, having started from 14th on the grid, with Boutsen 6th. At the sixth round in Montreal, Williams not only scored their first win with the Renault engine but also their first one-two: Thierry Boutsen came first followed by Patrese, resulting in 15 points for Williams's championship campaign. Williams came second in the Constructors' Championship, scoring 77 points in total; 64 points behind McLaren. Patrese finished 3rd in the Drivers' Championship with 40 points, 41 points behind the 1989 world champion, Alain Prost. Boutsen finished 5th in the championship with 37 points after also winning in Australia. Boutsen's win in Australia gave Williams the distinction of having won the first and last Grands Prix of the 1980s. In the 1990 season, Williams kept Patrese and Boutsen as the team's drivers. Although Patrese won the San Marino Grand Prix and Boutsen won pole position and the race at the Hungarian Grand Prix, the team scored 20 fewer points than the previous year and finished the Constructors' Championship two positions lower, in fourth. In the Drivers' Championship, Boutsen finished sixth with 34 points and Patrese seventh with 23 points. Boutsen left Williams and joined Ligier at the start of the 1991 season. His replacement was a returning Nigel Mansell, who had spent the previous two seasons driving for Scuderia Ferrari. Williams also recruited future 1996 world champion, Damon Hill, as one of their new test drivers. Williams failed to finish in the first Grand Prix of the season at Phoenix, both drivers retiring with gearbox problems. Patrese got back on track for the team in the next Grand Prix at Interlagos, coming second behind McLaren's Ayrton Senna. The 1991 San Marino Grand Prix saw both cars retiring again: Mansell after a collision and Patrese with an electrical failure after 17 laps. The Grand Prix at Monaco saw Mansell finish in a points-scoring position, coming second, 18 seconds behind Ayrton Senna. At the next race, the Canadian Grand Prix in Montreal, Williams locked out the front row only for Patrese to drop back with gearbox problems and Mansell to retire from the lead on the final lap with an electrical fault. At the following race, in Mexico, Williams achieved a 1–2, Patrese finishing ahead of Mansell to score 16 points for the Williams team. Williams then ran a streak of victories, with Mansell winning the French Grand Prix, five seconds ahead of Alain Prost's Ferrari. Mansell then won again at the British Grand Prix; it had been four years since a Briton had won the Grand Prix, Mansell having won it in 1987. Three consecutive victories became four when Mansell won again in Germany, with Patrese about 10 seconds behind him in second place. Senna ended Williams's run of victories by winning in Hungary, finishing five seconds ahead of Mansell. Mansell later won the Italian Grand Prix and the Spanish Grand Prix, while Patrese won the Portuguese Grand Prix after Mansell's race was ruined by a botched pitstop in which only three wheel nuts were fitted. Williams finished second in the Constructors' Championship, scoring 125 points in total, 14 points behind McLaren. Mansell finished second in the Drivers' Championship with 72 points, 24 points behind Senna. Williams took a step up for the 1992 season, keeping their 1991 driver line-up of Patrese and Mansell. Mansell dominated the first round in South Africa, qualifying in pole position and winning the race by 24 seconds from his teammate, Patrese. Nigel Mansell won the next four rounds for Williams, at Mexico City, Interlagos, Catalunya and Imola, Patrese coming second in all but one (the Spanish Grand Prix at Catalunya, where he retired after spinning off). Mansell's five victories in the opening five races was a new record in Formula One. Senna won the next race in Monaco, ahead of both Williams cars, which finished second and third. In the next race, in Canada, both Williams cars retired: Mansell spun off on entering the final corner (he claimed that Senna pushed him off) and Patrese had a gearbox failure. Mansell went on to record four more Grand Prix wins, including at the British Grand Prix. (In the final round, in Adelaide, the two Williams cars again retired, Mansell after Senna violently crashed into the back of him, and Patrese with electrical problems.) Williams won the Constructors' Championship with 164 points, 65 points more than second place McLaren. Mansell became World Champion, scoring 108 points, with Patrese finishing second with 56 points. Placing first in nine races, Mansell had set a new record for the most wins by a single driver in one season. Despite capturing the title and nine races, Nigel Mansell's seat was not safe for 1993 as Williams looked to sign either Alain Prost, who had taken 1992 off after he was fired by Ferrari, or Ayrton Senna, whose contract with McLaren was expiring. Patrese's position also looked to be under threat and he signed for Benetton before the end of the year. Ironically, Patrese could have remained at Williams; Prost was able to agree terms with Williams for 1993 and Mansell departed for CART rather than be teammates with Prost as they did not have a good relationship from their time together at Ferrari. Prost, in turn, did not wish to drive with his former teammate Ayrton Senna, due to their rivalry and thus negotiated a veto clause into his contract to freeze Senna out and keep him at McLaren. Test driver Damon Hill was promoted to join Prost in place of the departed Patrese. The Williams FW15C was an extremely dominant car, with active suspension and traction control systems beyond anything available to the other teams. Prost won on his debut for the team in South Africa and, like Mansell, dominated the weekend, taking pole position and finishing a minute ahead of Senna, who was second. The next Grand Prix in Brazil saw Prost collide with Christian Fittipaldi's Minardi in the rain on lap 29, while Hill went on to his first podium finish: second, 16 seconds behind Senna. Prost won three of the next four Grands Prix for Williams, Senna winning the other race. Prost and Hill later scored a 1–2 in France: the only 1–2 of the season for Williams. Prost won the next two Grands Prix at Silverstone and Hockenheim. Hill proved competitive especially in the second half of the season. Mechanical problems cost Hill leads in Britain and Germany, but he went on to win the next three Grands Prix at Hungary, Belgium and Italy which moved him to second in the standings, as well as giving him a chance of taking the Drivers' title. After Italy, Williams would not win a Grand Prix for the rest of the season, as a young Michael Schumacher won the following race in Portugal, and Senna took Japan and Australia to overtake Hill in the points. Williams retained their Constructors' title, 84 points ahead of second-placed McLaren. Prost clinched the Drivers' Championship in Portugal and finished the season 26 points ahead of second-placed Senna. 1993 marked the final season that Williams ran with Canon as its primary backer. During the 1994 season, Williams used FW16 (developed during the pre-season) and FW16B (with shorter sidepods and optimised for the revised floor regulations which were introduced during the season). 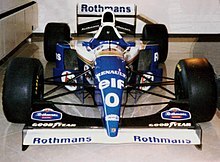 After Canon left the team Williams signed a contract with tobacco company Rothmans International for 1994, and their namesake brand became its primary sponsor from 1994 to 1997. As the provision in Alain Prost's contract regarding his former teammate-turned-rival had expired following the 1993 season, Williams pursued and signed Ayrton Senna to a contract for 1994 while Prost elected to retire from competition. Given this was the same team that had won the previous two World Championships with vastly superior cars, Senna was a natural and presumptive pre-season title favourite, with second-year driver Damon Hill intended to play the supporting role. Between them, Prost, Senna and Hill had won every race in 1993 but one, which was taken by Benetton's Michael Schumacher. Pre-season testing showed the FW16 had speed but was difficult to drive. The Fédération Internationale de l'Automobile (FIA) had banned electronic driver's aids, such as active suspension, traction control and ABS, to make the sport more "human". It was these technological advancements that the Williams chassis of the previous years had been built around. With their removal in 1994, Williams had not been a good-handling car, as observed by other F1 drivers, having been seen to be very loose at the rear. Senna himself had made numerous comments that the Williams FW16 had quirks which needed to be ironed out. It was obvious that the FW16, after the regulation changes banning active suspension and traction control, exhibited none of the superiority of the FW15C and Williams FW14B cars that had preceded it. The surprise of testing was Benetton-Ford which was less powerful but more nimble than the Williams. The first four rounds were won by Michael Schumacher in the Benetton-Ford. Senna took pole in the first two races but failed to finish either of them. In the third race, the 1994 San Marino Grand Prix in Imola, Senna again took pole position, but was involved in a fatal crash at the first corner after completing six laps. The repercussions of Senna's fatal accident were severe for the team itself, as the Italian prosecutors tried to charge the team and Frank Williams with manslaughter, an episode which was not over until 2005. At the next race in Monaco, Damon Hill was the only Williams on the grid, as a mark of respect to Senna, and retired on the first lap. Since Senna's death, every Williams F1 car has carried a Senna 's' on its livery in his honour and to symbolise the team's ongoing support of the Instituto Ayrton Senna. At the next race in Spain, Williams brought in test driver David Coulthard as Hill's new teammate. Hill took the team's first victory of the season, by almost half a minute over Schumacher's Benetton, while Coulthard would retire due to an electrical problem. In Montreal, both Williams cars finished in the points for the first time that season, with Hill finishing second and Coulthard finishing fifth. In France, Nigel Mansell replaced Coulthard (in the first of four appearances), at the behest of Renault. At Silverstone, Damon Hill accomplished what had eluded his father, twice Formula One World Champion Graham Hill, by winning the British Grand Prix. Hill closed the points gap with Schumacher, who was disqualified from first at Spa after the Stewards found floorboard irregularities on his Benetton. He was banned for the next two races, and Hill capitalised on this with wins in Italy and a Williams 1–2 in Portugal. With three races left, 1992 champion Nigel Mansell returned from CART (where the season had concluded) to replace Coulthard for the remainder of the season. Mansell would get approximately £900,000 per race, while Hill was paid £300,000 for the entire season, though Hill remained as lead driver. Schumacher came back after his suspension for the European Grand Prix, which he won by about 25 seconds, to take a lead of 5 points into the penultimate round in Japan. The race in Japan was held in torrential rain, with Hill managing to win the restarted race, by three seconds on aggregate over Schumacher who finished second. Going into the final round at Adelaide, Schumacher led Hill by a single point. Mansell took pole for Williams, but had a poor start which let Hill and Schumacher through to fight for the lead and the 1994 title. Midway through the race, Schumacher's perceived need for a low downforce setup cost him, as he lost control and clipped the outside wall at the 5th corner (out of sight of Hill). As Schumacher recovered, Hill came around the corner and attempted to overtake into the next corner. Schumacher turned in and the resulting contact (Schumacher in the wall and Hill retiring with bent suspension), meant Schumacher was the champion. This collision has been controversial. Some, such as Williams's Patrick Head, have suggested that this was a deliberate attempt by Schumacher to take Hill out of the race. Others, such as then BBC commentator Murray Walker, defended Schumacher, calling the accident a "racing incident". Meanwhile, Nigel Mansell won the last Grand Prix of his career here, driving the second Williams car. Williams would end the season as Constructors' Champion for the third consecutive year, scoring 118 points, while Hill finished second in the Drivers' Championship with 91 points. In 1995, Nigel Mansell was not retained, Williams favouring Coulthard over him to partner Hill. Schumacher, whose Benetton team had switched engine suppliers from Ford to Renault in the off-season, won the first round in Brazil, with Coulthard taking second. However, both were disqualified from the race after it was found that Elf supplied their teams with a type of fuel for which samples had not been provided to the FIA. Thus, Gerhard Berger and Ferrari were declared winners. Schumacher and Coulthard had their positions reinstated after appeal, though Benetton and Williams were not awarded their Constructors' points. Hill won the next two races in Argentina and San Marino and would later win races at The Hungaroring and in Adelaide. Hill won two laps ahead of the field at Adelaide in one of F1's most dominating victories. Coulthard recorded his only 1995 win for the Williams team at Estoril, before moving to McLaren. Williams's champion streak was ended by Benetton, who elected to switch engine suppliers from Ford to Renault, the same as Williams. As such, Benetton outscored Williams by 29 points in the Constructors' Championship. Damon Hill placed second in the Drivers' Championship, 33 points behind Benetton's Michael Schumacher. For 1996, Williams had the quickest and most reliable car, the FW18. Coulthard had left Williams to join Mika Häkkinen at McLaren, and Williams replaced him with Canadian Jacques Villeneuve, who had won the CART series title in 1995, while Hill remained with the team. Schumacher left Benetton to join Ferrari. Williams won the first five Grands Prix, Hill winning all but one of them. Olivier Panis would take victory at the sixth round in Monaco after both Williams cars retired. Hill would retire for the second time in a row after he spun-off in Spain, while his teammate, Villeneuve, took third place. Hill and Villeneuve dominated the next Grand Prix in Canada, with a 1–2 in qualifying and a 1–2 finish. Williams made it a second 1–2 after Hill won the French Grand Prix. Villeneuve won his second race in F1 at Silverstone after Hill retired with a wheel bearing failure on lap 26. Hill was victorious in the next Grand Prix in Germany while Villeneuve won the race after that in Hungary. Schumacher's Ferrari would then take the next two Grands Prix at Spa-Francorchamps and Monza. 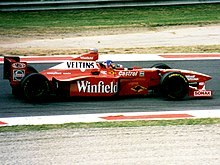 Villeneuve mounted a title challenge going into the final race of the season at Japan, but Hill reasserted his dominance to take the race and the 1996 title, while Villeneuve lost a wheel and retired. Williams's dominance was such that they had clinched the Constructors' Championship and only their drivers had a mathematical chance of taking the title, several races before the season concluded. Around that time, Frank Williams announced that Hill would not be re-signed after his contract expired, despite Hill's successes and eventual Drivers' Championship, so he joined Arrows for 1997. Adrian Newey had ambitions as a technical director (rather than just chief designer), but this was not possible at Williams, as Patrick Head was a founder and shareholder of the team. McLaren lured Newey away, though he was forced to take garden leave for the majority of 1997. For what would be the final season of Williams-Renault and a car designed with Newey's input, Frank Williams brought in German Heinz-Harald Frentzen, who had created a good impression on Williams during his first few seasons in Formula One. Frentzen proved to be a disappointment though, and won only one race in two years with Williams, the 1997 San Marino Grand Prix. Jacques Villeneuve won seven races during 1997, compared to five wins by his main rival, Michael Schumacher of a resurgent Ferrari. Williams also achieved the 100-race-win milestone at the British Grand Prix. Coming to the final round of the season at Jerez, Schumacher led Villeneuve by 1 point; however, on lap 48, Schumacher and Villeneuve collided. Schumacher was disqualified from second place in the championship as the accident was deemed by the FIA as "avoidable". Williams won the Constructors' title for the second time in a row, scoring 123 points. Jacques Villeneuve won the Drivers' Championship by three points to Michael Schumacher, who kept his points total despite being removed from second place; thus, runner-up went to Frentzen with 42 points. After 1997, the team were unable to maintain their dominance in Formula 1 as Renault ended their full-time involvement in Formula 1, and Adrian Newey moved to rival team McLaren. Williams then had to pay for Mecachrome engines, which were old, rebadged Renault F1 engines. This meant that the FW20 not only featured a very similar aerodynamic package to their 1997 car, but also virtually the same engine, leading some to comment that they ran what was virtually the same car, adjusted for the 1998 regulations. There were changes on the sponsorship front, as Rothmans opted to promote their Winfield brand, replacing the popular blue and white livery with a red one. For 1998, Williams kept both drivers from the previous season, the first time since 1983 that a reigning world champion remained driving for the team. While Ferrari and McLaren battled for the Constructors' and Drivers' titles, Williams fell to the middle of the field. The team won no races and took only 3 podiums during the season, with Frentzen finishing in third at the first round in Australia and Villeneuve finishing third in Germany and Hungary. Williams finished third in the Constructors' Championship, scoring 38 points, while Villeneuve finished fifth in the Drivers' Championship with 21 points and his German teammate, Frentzen, finished 4 points behind him in seventh. 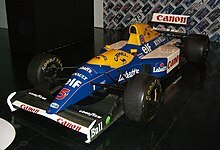 In 1999, Williams employed the Supertec engine, which was a rebadged Mecachrome-Renault unit, and a new driver line-up. Villeneuve moved to the new British American Racing (BAR) team and Frentzen moved to the Jordan team. German Ralf Schumacher joined Williams in what amounted to a driver trade as Frentzen would be taking over Schumacher's old ride at Jordan. Alex Zanardi, an Italian driver who had won the last two CART series championships, also joined the team after Williams had spent the better part of the last year trying to sign him. The team managed three podiums, all scored by Ralf Schumacher, with third place in Australia and Britain and a second place in Italy. The team finished fifth in the Constructors' Championship, the lowest finish for Williams in the 1990s; the team finished behind Stewart and Jordan, scoring a total of 35 points. Of those points, all were scored by Schumacher as Zanardi, who had not performed well in his previous stint in F1, failed to finish in the top six in any race. At the end of the season, Williams bought out Zanardi's contract. During 1998, the team signed a long-term agreement with German manufacturer BMW to supply engines and expertise for a period of 6 years. As part of the deal BMW expected at least one driver to be German, which led to the team's signing of Ralf Schumacher for the previous season. In 1999, the team had a Williams car with a BMW engine testing at circuits, in preparation for a debut in the 2000 season. There were major sponsorship changes for 2000–2005, as Rothmans International had been purchased in 1999 by British American Tobacco (BAT), which owned British American Racing and chose not to renew Rothmans contract with Williams. BMW paid for Williams cars to be entirely in blue and white – unlike the standard motorsport livery scheme, dominated by the colours of the team or major sponsors with the logos of minor sponsors in their own colour schemes. Williams second major sponsor became Compaq, and following Compaq's acquisition the team debuted Hewlett-Packard (HP) sponsorship at the 2002 British Grand Prix. Complaints about the HP logo on the rear wing led to its replacement in 2003 with the sponsor's tag line, "Invent". In a cross-promotion of this technological partnership, a worldwide television commercial featured drivers Ralf Schumacher and Juan Pablo Montoya seemingly driving their BMW Williams cars around a track by radio control from a grandstand. The new "clean" image allowed Williams to sign a cigarette anti-craving brand, Niquitin, and Anheuser-Busch, alternating with the Budweiser beer brand and SeaWorld Adventure Parks, in compliance with trademark disputes or alcohol bans. Williams sought the services of Colombian Juan Pablo Montoya, who had replaced Zanardi at Chip Ganassi Racing in 1999, to step-in but Montoya was under contract to Ganassi for one more season. Britain's Jenson Button was called upon and made his debut instead. The first season of Williams' partnership with BMW did not yield a single victory, but they managed to get on the podium three times, with Ralf Schumacher responsible for all three. Williams finished third in the Constructors' Championship, with 36 points, one more than the prior year. Ralf Schumacher finished fifth in the Drivers' Championship, while Button, in his debut season, finished in eighth. Button made scrappy mistakes in early races (Monaco, Europe), but overall made an impressive debut in Melbourne, and continued to impress, notably at Silverstone, Spa and Suzuka. In 2001, Button moved to Benetton-Renault due to Montoya's arrival on the team. The FW23 won four races, three by Ralf Schumacher at Imola, Montreal, and his home Grand Prix in Germany. His teammate, Montoya, was victorious at Monza, and would have won a few more races if not for the FW23's unreliability and pit crew blunders. The car proved to be quicker than the Ferrari and McLaren counterparts in several races, but Williams's 2001 campaign only yielded third place in the Constructors' Championship. Williams maintainted their driver line-up for the 2002 season. The team only won one race, which was at Malaysia, one of only 2 races not won by Ferrari in a year dominated by the Ferraris of Michael Schumacher and Rubens Barrichello. Williams did improve on their Constructors' Championship position, finishing in second. 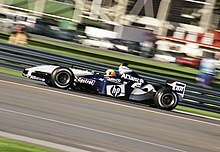 Montoya finished third in the Drivers' Championship, eight points ahead of Ralf Schumacher, who finished fourth. In qualifying for the Italian Grand Prix at the 5.793 km (3.600 mi) Monza circuit, Montoya lapped his Williams FW24 in 1:20.264 for an average speed of 161.449 mph (259.827 km/h), breaking the speed record of 160.938 mph (259.005 km/h) set by Keke Rosberg in a Honda turbo-powered Williams FW10 at Silverstone for the 1985 British Grand Prix. 2003 would see Williams come closest to winning its first title since 1997. During pre-season, Frank Williams was very confident that the FW25 would challenge for the title. The team won four races, with Montoya winning at Monaco and Germany, while Ralf Schumacher won at the Nürburgring and the following race at Magny-Cours. Montoya stayed in contention for the Drivers' Championship during the season, and finished third, 11 points behind Michael Schumacher, while Ralf Schumacher finished fifth, 24 points behind Montoya. Williams finished second in the Constructors' Championship, two points ahead of McLaren. At the start of the 2004 season, it was announced that Montoya would be moving to McLaren in 2005. The team began the season with a radical nose-cone design, known as the "Walrus-Nose", that proved uncompetitive and was replaced by a more conventional assembly in Hungary. Ferrari dominated for a third consecutive season, winning 15 of the 18 races. Williams picked-up a win at the final race in Brazil, with Juan Pablo Montoya finishing one second ahead of Kimi Räikkönen's McLaren; this remained Williams's last F1 win until the 2012 Spanish Grand Prix. Another low part of the season was when both Williams and Toyota were disqualified from the Canadian Grand Prix after it was discovered that both cars had brake irregularities, the brake ducts seemingly not conforming to regulations. Williams finished the season in fourth, scoring 88 points and finishing on the podium six times, while Montoya was the highest-placed Williams driver that year, scoring 58 points to finish in fifth position. For the 2005 season, Schumacher moved to Toyota, while Montoya moved to McLaren. Taking their places were Australian Mark Webber and German Nick Heidfeld. Jenson Button was to have driven for Williams in 2005, but an FIA ruling forced Button to remain with his current team, BAR. Antônio Pizzonia served as the test driver for the team during the 2005 season. Meanwhile, Button signed a contract to drive for Williams in 2006. During the course of the 2004 and 2005 F1 seasons, BMW Motorsport and director Mario Theissen increasingly became publicly critical of the Williams F1 team's inability to create a package capable of winning the Constructors' Championship, or even multiple victories within a single season. Williams, on the other hand, blamed BMW for not producing a good enough engine. Williams's failed attempt to prise Jenson Button out of his BAR contract may also have been an issue with Theissen. Despite Frank Williams's rare decision to capitulate to commercial demands by employing German driver Nick Heidfeld when he allegedly preferred Antônio Pizzonia, the fallout between Williams and BMW continued through the 2005 Formula One season. Despite BMW's contract with Williams to supply engines until 2009, this public deterioration of the relationship between Williams and BMW was a factor in the decision by BMW Motorsport to buy Sauber and rebrand that team to feature the BMW name. Williams could have opted to continue with BMW engines in 2006, despite the fact that the engine manufacturer was about to set up its own team. In the end, though, Williams opted for Cosworth V8 engines for 2006. The 2006 season saw Nico Rosberg replace German Nick Heidfeld, who departed for BMW Sauber, while Mark Webber stayed on with the team. Despite having signed a contract to race for Williams, Jenson Button decided to stay with BAR for 2006 as it was to become a Honda works team. In September 2005 a deal was reached to allow Button to remain with BAR, with Williams receiving around £24m, some of it paid by Button himself, to cancel this contract. Williams and Cosworth entered a partnership agreement where Cosworth would supply engines, transmissions and associated electronics and software for the team. Major sponsors Hewlett-Packard concluded sponsorship agreements one year before their official end of contract. The Williams team also switched to Bridgestone tyres. The season started well, with both drivers scoring points in the opening race of the season, and Nico Rosberg setting the fastest lap at the Bahrain Grand Prix. The rest of the season was disappointing for Williams, with 20 retirements out of 36 starts for the two cars. The team failed to finish on the podium all season, the first time this had happened since Williams's debut season in 1977. The team eventually finished eighth in the Constructors' Championship, with only 11 points. Following Williams's worst points tally since 1978, the team announced that Japanese manufacturer Toyota would be supplying the engines for the 2007 season. A number of other changes were announced for 2007: Alexander Wurz, who had been a test driver at Williams since 2006, became the team's second driver to replace the outgoing Mark Webber; Japanese driver Kazuki Nakajima, son of Satoru, replaced Wurz as a test driver alongside Karthikeyan. Sponsorship saw a change in 2007, as it was announced that AT&T would become the title sponsors for the team from the upcoming season. AT&T were previously involved as minor sponsors with the Jaguar and McLaren teams, but moved to Williams following McLaren's announcement of a title sponsorship deal with Vodafone, a competitor of AT&T. On 2 February, the new FW29 was presented to the media in the UK. Soon afterwards, the team secured a sponsorship deal with Lenovo who built the team's new supercomputer. Rosberg and Wurz gave Williams a more productive season in terms of points and, in Montreal, Wurz scored the team's first podium finish since Nick Heidfeld's second-place at the 2005 European Grand Prix. Over the course of the year Rosberg was consistently in the points, scoring 20 during the season; in comparison, teammate Wurz finished in the points three times. Following the announcement that Wurz would be retiring from the sport, Williams brought in their young test driver Nakajima to drive the second car for them in the final race in Brazil. The Japanese driver finished in tenth despite starting from near the back of the grid, while Rosberg enjoyed his best race of the season, finishing in fourth. Williams finished fourth in the Constructors' Championship that year. For the 2008 season, Williams confirmed Nico Rosberg and Kazuki Nakajima as their race drivers. Rosberg was confirmed as staying with Williams until the end of 2009 on 9 December 2007, ending speculation that he could take Fernando Alonso's vacated seat at McLaren. During the Winter testing sessions, the team ran six different liveries to celebrate their 30th year in the sport and their 500th Grand Prix. The 2008 season was a mixture of success and disappointment for Williams. While Rosberg managed to obtain 2 podiums in Australia and Singapore, the team struggled at circuits with high-speed corners. The fact that the team was one of the first to switch development to their 2009 car (when new regulations came in) also hindered their season, and Williams finished a disappointing 8th in the Constructors' Championship. Rosberg stated that unless the team was more competitive in the near future, he would look to drive elsewhere. Williams retained Rosberg and Nakajima for the 2009 season. Frank Williams had admitted that he had regretted parting with BMW but stated that Toyota had tremendous ability to become a top engine supplier. Speculation had been surrounding Toyota's future on the Formula 1 grid. This was due to the fact that for a big budget team, Toyota had only managed second place as their best result. In December 2008, Williams confirmed their commitment to F1 following the Honda withdrawal announcement. Ahead of the 2009 Brazilian Grand Prix, Williams announced that it would be ending its three-year partnership with Toyota and finding a new engine supplier for 2010. After the termination of their Toyota contract, Williams announced that from the 2010 season they were to enter into a "long-term partnership" with Cosworth, and would be using an updated version of the CA V8 engine which powered their cars in 2006. Williams also announced a complete driver change for the 2010 season. Rubens Barrichello joined from 2009 Constructors' Champion Brawn GP, whilst GP2 champion Nico Hülkenberg graduated from the test driver seat. Replacing Hülkenberg in the test seat was Finland's Valtteri Bottas, who finished third in the 2009 Formula Three Euroseries as well as winning the non-championship Masters of Formula 3 event at Zandvoort. Their new 2010 car, the Williams FW32, was unveiled for the first time at a shakedown test at Silverstone. Its first official test was on 1 February at Circuit Ricardo Tormo in Valencia. Hülkenberg took the team's first pole position in over five years, in variable conditions at the Brazilian Grand Prix. Hülkenberg was dropped from the team ahead of the 2011 season, and replaced by Venezuelan newcomer and reigning GP2 Series champion Pastor Maldonado. The combination of Barrichello and Maldonado meant that 2011 would be the first time since 1981 that Williams would start a season without a European driver in their line-up. At the second pre-season test in Jerez, Barrichello posted the fastest time of the week on the last day. That was to no avail as Williams endured one of their worst seasons to date: two ninth places for Barrichello and one tenth place for Maldonado were their best results during the entire year. After Brazil, the team ended with a ninth place in the Constructors' Championship. On 4 July 2011, Williams announced they would be reuniting with engine-supplier Renault who were to supply the team's engines from 2012 onwards. On 1 December 2011, it was confirmed that Maldonado would be retained for the 2012 season, along with reserve driver Valtteri Bottas, who took part in 15 Friday practice sessions. On January 2012, it was confirmed that Bruno Senna would be the driver to partner Maldonado, effectively ending Rubens Barrichello's F1 career. Prior to the 2012 season, Patrick Head moved from the Williams F1 team to Williams Hybrid Power Limited, another subsidiary of Williams Grand Prix Holdings. The team also announced that its relationship with AT&T ended by mutual agreement, and there were negotiations with another telecommunications company for team's title sponsorship. At the 2012 Spanish Grand Prix, Pastor Maldonado took his first Grand Prix victory, which was also Williams's first race victory since 2004 Brazilian Grand Prix. Around 90 minutes after celebrating this win, a fire broke out in the garage of the Williams team, damaging the FW34 of Bruno Senna and leaving several injured. The team eventually achieved eighth position in the Formula One World Constructors' Championship. Claire Williams, the daughter of team principal Frank Williams, was appointed deputy principal in March 2013. Maldonado was retained by the team for 2013 and was joined by Bottas, promoted from his role as test driver. The team struggled throughout the season, despite a good qualifying session at the Canadian Grand Prix and a place in the top 10 at the United States Grand Prix, scoring only five points in the World Constructors' Championship. In May 2013, Williams signed a long-term contract with Mercedes to supply engines for the team, the German manufacturer providing 1.6-litre V6 turbo engines from the start of the 2014 season. Bottas was retained as driver for 2014, and Felipe Massa was signed from Ferrari to replace Maldonado. The team also unveiled a new, multi-year title sponsorship deal with drinks brand Martini. As part of the deal, the team became Williams Martini Racing, except in Bahrain, Russia and Abu Dhabi, where the team is known as Williams Racing because of alcohol advertising restrictions. The team received their first pole position since 2012, courtesy of Massa at the Austrian Grand Prix; it was the only time that Mercedes would be beaten to pole position over the course of the 2014 season. With Bottas qualifying alongside Massa, it was also the first time the team had locked out the front row since the 2003 German Grand Prix. The team enjoyed an upturn in performance, including a double podium in Abu Dhabi, resulting in them taking third place in the Constructors' Championship. They repeated this feat in the 2015 season, despite a low-key season owing to the resurgence of Ferrari. The team went into the 2016 season with Bottas and Massa retained. Former Ferrari Driver Academy member Lance Stroll joined the team as a development driver; Alex Lynn became a reserve driver with Paul di Resta who was announced on 13 March, following Susie Wolff's retirement from motorsport. In September 2016, Massa announced his intentions to retire from Formula One, with Stroll later announced as his replacement for 2017. Following Nico Rosberg's decision to retire, the team released Bottas from his contract to allow him to take his place at Mercedes, with Massa returning to the team on a one-year deal. Massa was forced to withdraw from the 2017 Hungarian Grand Prix due to illness, the team therefore announced that Paul di Resta would be racing alongside Stroll instead. On 4 November 2017, Felipe Massa announced his decision to retire from F1. Sergey Sirotkin was signed as his replacement for 2018, with Robert Kubica joining the team as a reserve and development driver. Williams struggled over the course of the 2018 season, scoring only 7 points and finishing last in the Constructors' Championship standings. Although the reliability of the car appeared good, they were significantly off the pace; their highest finish was 8th place in Azerbaijan by Lance Stroll. The team's only other points finish was at the Italian Grand Prix, with Stroll finishing 9th and Sirotkin scoring his first championship point in 10th. On 27 February 2018 Martini announced that they will leave Williams and Formula One at the end of the 2018 season. On 12 October 2018, the team announced that George Russell would be joining the team for the 2019 season and on 22 November 2018 it was announced that Robert Kubica would join him as his teammate. On 29 November was announced a partnership with PKN Orlen, a leading player in the fuels and energy market. On 11 February 2019, telecommunications company ROKiT were announced as title sponsors of the team as part of a multi-year deal. Williams Grand Prix Engineering March 761 Ford-Cosworth DFV 3.0 V8 G 27. Williams Grand Prix Engineering FW06 Ford-Cosworth DFV 3.0 V8 G 27. FW07 Ford-Cosworth DFV 3.0 V8 G 27. FW07B Ford-Cosworth DFV 3.0 V8 G 27. FW08 Ford-Cosworth DFV 3.0 V8 G 5. TAG Williams Racing Team FW08C Ford-Cosworth DFV 3.0 V8 G 1. Honda RA164E 1.5 V6 t G 5. FW10B Honda RA164E 1.5 V6 t G 5. FW13 Renault RS1 3.5 V10 G 5. Renault RS4 3.5 V10 G 5. Canon Williams Team FW15C Renault RS5 3.5 V10 G 0. FW16B Renault RS6 3.5 V10 G 0. FW17B Renault RS7 3.0 V10 G 5. BMW WilliamsF1 Team FW24 BMW P82 3.0 V10 M 5. BMW WilliamsF1 Team FW25 BMW P83 3.0 V10 M 3. AT&T Williams FW29 Toyota RVX-07 2.4 V8 B 16. AT&T Williams FW33 Cosworth CA2011K 2.4 V8 P 11. Williams Martini Racing FW40 Mercedes M08 EQ Power+ 1.6 V6 t P 18. ROKiT Williams Racing FW42 Mercedes 1.6 V6 t P 63. Williams Grand Prix Holdings is the public company of Williams Group, that includes the Formula One Team, Williams Advanced Engineering and others like Williams Heritage and collaborations with other brands. Williams Advanced Engineering (WAE) is the technology and engineering services business of the Williams Group. 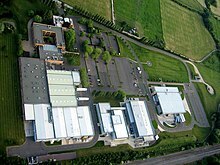 Based in the United Kingdom, it is located in a dedicated facility of 3,800 square metres (41,000 sq ft), adjacent to Williams Formula One facilities. WAE's target markets are: automotive, motorsport, civil aerospace, defence (land, sea and air), renewable energy and sports science. The company provides the battery technology used in Formula E, and has assisted the development of the electric Vanda Dendrobium car from Singapore. It has worked with Jaguar to create the revolutionary C-X75 hybrid supercar. WAE partnered once again with Jaguar to build new stunt C-X75s for the 24th James Bond film, SPECTRE. WAE announced in June 2013 a new collaboration with Nismo, the performance orientated brand of Nissan, to partner in the development of high performance road cars. The company announced in August 2017 a collaboration with Singer Vehicle Design. The first fruit of this work is a modified, naturally aspirated, air-cooled, flat-six Porsche 911 engine with a 4.0L capacity, four-valves per cylinder and four cam-shafts, rated at 500HP. WAE generated revenues of £10.9m in fiscal year 2014–15, with profits of £1m. Williams Hybrid Power (WHP) was the division of Williams F1 that developed electromechanical flywheels for mobile applications such as buses, trams and high-performance endurance-racing cars. A hybrid system that uses a spinning composite rotor to store energy, these flywheels help a vehicle save fuel and ultimately reduce its CO2 emissions. WHP was first established in 2008 and immediately set about developing a new flywheel energy-recovery system for the Williams F1 Team after the introduction of Kinetic Energy Recovery Systems (KERS) into Formula One for the 2009 season. While other teams were pouring their efforts into electric battery systems, Williams F1 opted to go down the flywheel route because of a strong belief in the technology's wider applications. While it was never raced in Formula One due to technical changes, WHP has since seen its technology adapted for a range of applications. For example, the Audi R18 hybrid car that won the 2012 Le Mans 24 Hours used a WHP flywheel. WHP has also seen its flywheel technology introduced into a series of buses as part of a deal with the Go-Ahead Group, one of the UK's biggest transport operators. In April 2014, Williams Hybrid Power was sold to GKN. Williams Heritage (WH) is the retired chassis and restoration division of Williams F1 (similar to Ferrari F1 Clienti and Classic Team Lotus) that keeps and maintains old retired Williams Formula One chassis that are no longer in racing use or are prepared for historic events and show runs or for the client that used in track. 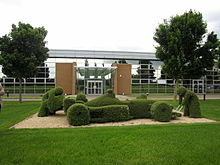 The division's headquarters are located at the Formula One team's Grove site and also manages and looks after the Williams Grand Prix collection. The division is currently managed by Jonathan Williams and longtime Williams mechanic Dickie Stanford. Williams developed the car for the revived Formula Two championship, beginning in 2009. The design was originally created for a new, more-powerful offshoot of the Formula Palmer Audi series, however the car was re-purposed when Jonathan Palmer's MotorSport Vision successfully bid for the rights to run the new Formula Two series. The Metro 6R4 rally car was developed by Williams in 1984 on commission from Rover. The rally car was a MG Metro with a completely new V6 engine (mid-engined) and four-wheel drive, developed to the international Group B rallying regulations. Williams developed the car in just six months. Williams entered the British Touring Car Championship in 1995, taking over the works Renault program. Alain Menu transferred from Renault Dealer Racing, with Will Hoy signed to partner him. Williams employed Ian Harrison, future director of Triple Eight Racing as team manager. While Menu was a championship contender, Hoy had constant failures and bad luck during the first half of the season. However, Hoy's luck changed and he won three races and scored several podium finishes in the second half of the year, eventually taking fourth in the championship while Menu finished second in the championship with seven wins. Renault won the manufacturers championship. 1996 was a more difficult year with the front-wheel-drive cars outclassed by the 4WD Audi A4s of Frank Biela and John Bintcliffe. Menu was second in the championship again, while Hoy finished a lowly ninth. 1997 was a breakthrough year for Williams, winning the drivers' championship with Menu, the manufacturers' trophy and teams' award. Other changes for the team saw Jason Plato replacing Hoy, taking third in the championship. The team won 15 races out of 24 in 1997. It also competed in the 1997 Bathurst 1000 with Menu and Plato leading for much of the early part of the race. Alan Jones drove the second car, his first appearance for Williams since 1981. 1998 saw few changes to the Williams team: the driver line-up was unchanged with Menu to defend his title alongside Plato, but the main sponsor for 1998 was Nescafé, with Renault still putting sponsorship in for the team. While the Renaults had a new look for 1998, the opposition had caught up after 1997, and both Menu and Plato had a more difficult season, finishing fourth and fifth in the championship. In the final round of 1998 at Silverstone, a third car was entered for Independents Champion Tommy Rustad. Renault ultimately finished third in the manufacturers trophy and second in the teams championship. 1999 was the most difficult season for Williams, as Menu left Renault after racing with them since 1993. Plato was joined by Jean-Christophe Boullion. Nescafé were again the main sponsor for the Williams team in 1999. Renault did not have much luck in 1999 with engine failures haunting the team during the mid-part of the seasons. One win for Plato was the only success for the season, and Renault pulled out of the BTCC at the end of the season. Prior to their F1 partnership, Williams Motorsport built Le Mans Prototypes for BMW, known as the V12 LM and V12 LMR. The V12 LMR won the 24 Hours of Le Mans in 1999. The car was driven by Pierluigi Martini, Yannick Dalmas and Joachim Winkelhock, and operated by Schnitzer Motorsport under the name of BMW Motorsport. The Williams name and logo were used on the Renault Clio Williams, a limited sports model of the production supermini, which was Formula One's safety car in 1996. However, no input was provided by Williams into the development of the car. Through subsidiary Williams Hybrid Power, the company developed and supplied a flywheel-based kinetic-energy storage system which was in use on a Porsche 911 GT3 R car in various GT racing series. The car achieved its first victory on 28 May 2011 at the 4th round of the VLN Endurance Racing Championship held at the Nürburgring. Williams's Advanced Engineering division collaborated with Jaguar Racing in its debut season. ^ Collantine, Keith (12 October 2018). "George Russell handed F1 debut with Williams in 2019". www.racefans.net. Retrieved 12 October 2018. ^ "Latifi joins Williams as reserve driver for 2019". Formula1.com. Formula One World Championship Limited. 3 December 2018. Retrieved 3 December 2018. ^ Kuczera, Łukasz. "Specjalne zadanie dla Roberta Kubicy. "Claire Williams tego ode mnie oczekuje"" (in Polish). Sportowe Fakty. Retrieved 22 November 2018. ^ Cooper, Adam. "Williams considering 2019 Mercedes F1 gearbox supply deal". autosport.com. Motorsport Network. Retrieved 29 August 2018. ^ Extra 6 points are David Coulthard's points from 1995 Brazilian Grand Prix which were not counted towards 1995 World Constructors' Championship. ^ "Williams F1 profile". GrandPrix.com. Retrieved 9 June 2012. ^ Baldwin, Alan (20 November 2009). "Williams F1 team sells stake to Austrian investor | Reuters". Reuters. Retrieved 15 March 2010. ^ "Wolff: Value of privateers will rise". Autosport. 20 November 2009. Retrieved 15 March 2010. ^ "Williams Formula 1 team to float on Frankfurt Stock Exchange". BBC News. 4 February 2011. Retrieved 4 February 2011. ^ Sylt, Christian. "The Formula For Survival in F1". forbes.com. Retrieved 29 April 2018. ^ Williams Grand Prix Engineering – 1977 results www.f1db.com. Retrieved 22 August 2006. ^ "Grand Prix Results: United States GP, 1978". GrandPrix.com. Retrieved 13 November 2006. ^ Hamilton, Maurice. Frank Williams. Macmillan. p. 80. ISBN 0-333-71716-3. ^ "Grand Prix Results: French GP, 1979". GrandPrix.com. Retrieved 9 June 2012. ^ Hamilton, Maurice. Frank Williams. Macmillan. pp. 148–153. ISBN 0-333-71716-3. ^ "ITV-F1.com: WilliamsF1 Highs And Lows". ITV F1. ITV. 15 January 2007. Archived from the original on 29 September 2007. Retrieved 15 May 2007. ^ "The changing face of F1". BBC Sport. 28 February 2005. Retrieved 12 July 2006. ^ Saward, Jow (1 July 1993). "Frank Williams Interview". GrandPrix.com. Retrieved 14 July 2006. ^ Manishin, Glenn. "After Tamburello". F1-Grandprix.com. Retrieved 13 June 2006. ^ "1994: Formula One's 'blackest day'". BBC News. 1 May 1994. Retrieved 13 July 2006. ^ "Top designers acquitted on Senna". BBC News. 27 May 2005. Retrieved 13 July 2007. ^ 'WilliamsF1.com > Seasons > 1994. Retrieved 14 July 2006. ^ Hamilton, Maurice. Frank Williams. Macmillian. p. 244. ISBN 0-333-71716-3. ^ Horton, Roger. "Reflections on a Racing Rivalry". Atlas Autosport. Kaizar. Retrieved 1 October 2010. ^ 'Ruthless' Schumi blasted. Retrieved 2 August 2006. ^ Saward, Joe (2 December 1996). "Review of the year 1996". GrandPrix.com. Retrieved 1 October 2010. ^ Saward, Joe (1 November 1997). "Review of the year 1997". GrandPrix.com. Retrieved 9 June 2012. ^ Saward, Joe (1 January 1998). "Mecachrome". GrandPrix.com. Retrieved 14 July 2006. ^ Saward, Joe (28 January 1998). "Williams FW20". GrandPrix.com. Retrieved 14 July 2006. ^ Hewlett-Packard Corporate- HP Technology and BMW Williams F1 Team. Retrieved 19 July 2006. ^ GlaxoSmithKline. Retrieved 19 July 2006. ^ Anheuser-Busch, Inc.: Budweiser sponsors BMW WilliamsF1 Team. Retrieved 19 July 2006. ^ SeaWorld Adventure Parks To Be Featured With BMW WilliamsF1 Team. Retrieved 19 July 2006. ^ Benson, Andrew (13 October 2002). "Schumacher paints F1 red". BBC Sport. Retrieved 13 July 2008. ^ "Williams launch new car". BBC Sport. 31 January 2003. Retrieved 13 July 2008. ^ "Webber signs to BMW WilliamsF1". Castrol. 28 July 2004. Archived from the original on 8 February 2012. Retrieved 13 July 2006. ^ "BMW sign Heidfeld for new F1 team". BBC Sport. 16 September 2005. Retrieved 13 July 2006. ^ "Williams firm on Button". BBC Sport. 6 August 2004. Retrieved 9 June 2009. ^ "Williams: BAR can have Button but..." Crash.net. Crash Media Group. 29 August 2005. Retrieved 9 June 2009. ^ "BMW: Williams must improve". BBC Sport. 18 May 2003. Retrieved 8 June 2009. ^ "Williams criticises partner BMW". BBC Sport. 8 June 2005. Retrieved 9 June 2012. ^ "BMW buys Sauber to form own team". BBC Sport. 22 June 2005. Retrieved 9 June 2012. ^ "Williams turn to Cosworth engines". BBC Sport. 15 August 2005. Retrieved 9 June 2012. ^ "Williams sign Toyota engine deal". BBC Sport. 27 July 2006. Retrieved 9 June 2012. ^ AT&T Title Sponsor for WilliamsF1. Retrieved 20 October 2006. ^ Vodafone will be McLaren's Title Sponsor 20 October 2006. ^ Elizalde, Pablo (8 October 2007). "Wurz confirms immediate retirement from F1". Autosport. Haymarket Media. Retrieved 8 October 2007. ^ "Rosberg agrees new Williams deal". BBC News. 9 December 2007. Retrieved 9 December 2007. ^ "Williams to run six different liveries this winter". GPUpdate.net. 14 January 2008. Retrieved 1 February 2011. ^ "Commitment to remain in F1". BBC News. 8 December 2008. Retrieved 8 December 2008. ^ "Williams confirm Cosworth for 2010". Racecar Engineering. 30 October 2009. Retrieved 2 November 2009. ^ Beer, Matt (29 January 2010). "Williams signs Bottas as test driver". Autosport. Haymarket Media Group. Retrieved 29 January 2010. ^ "Exclusive: First image of new Williams". autosport.com. 28 January 2010. Retrieved 6 February 2016. ^ "BBC Sport – F1 – Nico Hulkenberg takes Brazilian GP pole for Williams". BBC Sport. Retrieved 6 February 2016. ^ "Williams sign Venezuelan Pastor Maldonado for 2011 F1 season". The Guardian. UK. Press Association. 2 December 2010. Retrieved 3 February 2011. ^ "Williams Renault Legendary Partnership Revived for 2012". AT&T Williams. Williams F1. 4 July 2011. Archived from the original on 7 July 2011. Retrieved 4 July 2011. ^ "Pastor Maldonado Confirmed for 2012 with Valtteri Bottas as Reserve Driver". Williams F1. Williams Grand Prix Engineering Limited. 1 December 2011. Archived from the original on 3 December 2011. Retrieved 1 December 2011. ^ "Patrick Head Steps Down from WGPH Board of Directors". Williams. Williams F1. 31 December 2011. Archived from the original on 3 January 2012. Retrieved 4 January 2012. ^ Baldwin, Alan (4 January 2012). "The Williams Formula One team are seeking a new title sponsor after the termination of their agreement with U.S. telecommunications giant AT&T". Thomson Reuters. Reuters. Retrieved 4 January 2012. ^ "Spanish Grand Prix 2012: Pastor Maldonado holds off Fernando Alonso to claim historic win for Williams". Telegraph.co.uk. 13 May 2012. Retrieved 5 February 2016. ^ "Formula 1 Drivers & Constructors Standings – FIA Formula One World Championship 2012 – ESPN.co.uk". ESPN UK. Retrieved 5 February 2016. ^ "Claire Williams becomes deputy principal". Supersport.com. Retrieved 25 June 2015. ^ Elizalde, Pablo (28 November 2012). "Williams confirms Valtteri Bottas and Pastor Maldonado for 2013". Autosport. Haymarket Publications. Retrieved 28 November 2012. ^ "Teams & Drivers – Williams". Formula1.com. Retrieved 30 January 2015. ^ "Williams move to Mercedes power for 2014". Formula1.com. Formula One Administration. 30 May 2013. Archived from the original on 7 June 2013. Retrieved 13 December 2014. ^ "Williams unveil Martini as their new sponsor as they head into new season full of hope". Daily Mail. 6 March 2014. Retrieved 7 March 2014. ^ Weaver, Paul (21 June 2014). "Felipe Massa on pole at F1's Austrian GP as Lewis Hamilton spins". The Guardian. Guardian Media Group. Retrieved 13 December 2014. ^ "Paul di Resta set to be named Williams reserve driver for 2016 season". BBC Sport. 13 March 2016. Retrieved 20 August 2016. ^ Benson, Andrew (11 November 2015). "Lance Stroll to test for Williams in 2016". BBC Sport. Retrieved 6 December 2015. ^ "Bottas to Mercedes, Massa to re-join Williams". Formula1.com. Formula One World Championship Ltd. 16 January 2017. Retrieved 16 January 2017. ^ "Paul di Resta to replace unwell Felipe Massa in Hungary". BBC Sport. 29 July 2017. Retrieved 5 November 2017. ^ "Felipe Massa: Williams driver to retire at end of the season". BBC Sport. 4 November 2017. Retrieved 5 November 2017. ^ Barretto, Lawrence (16 January 2018). "Sergey Sirotkin beats Robert Kubica to 2018 Williams F1 seat". autosport.com. Retrieved 16 January 2018. ^ Barretto, Lawrence (16 January 2018). "Kubica named Williams' reserve driver". Motorsport.com. Motorsport Network. Retrieved 16 January 2018. ^ Barretto, Lawrence (27 February 2018). "Martini and Williams to end sponsorship deal". Motorsport.com. Motorsport Network. Retrieved 27 February 2018. ^ Collantine, Keith (12 October 2018). "Russell handed F1 debut in place of Stroll at Williams for 2019". RaceFans. Retrieved 12 October 2018. ^ "WILLIAMS MARTINI RACING and PKN ORLEN Announce Partnership". www.williamsf1.com. Retrieved 30 November 2018. ^ "ROKiT Enters Formula One as Title Partner of Williams Racing". Williams Racing. 11 February 2019. Retrieved 11 February 2019. ^ "Hall of Fame – the World Champions". Formula One Management. Retrieved 27 July 2015. ^ "INSIGHT: Williams battery technology". 31 October 2014. Retrieved 6 September 2016. ^ "A new all-electric hypercar powered by Formula E-tech: Vanda's Dendrobium". 7 March 2017. Retrieved 7 March 2017. ^ "Williams cuts losses as revenues accelerate". BBC News. 4 September 2015. ^ "GKN Acquires Williams Hybrid Power". Williams F1. 1 April 2014. Archived from the original on 10 April 2014. Retrieved 2 January 2015. ^ "FIA Formula 2 Website : The F2 Car". Archived from the original on 6 January 2009. Retrieved 19 February 2009. ^ "BMW wins at Le Mans". Autosport. 13 June 1999. Archived from the original on 28 September 2007. Retrieved 14 November 2006. ^ "Porsche GT3R Hybrid "2.0" takes top honours in Germany". WHP. 28 May 2011. Archived from the original on 5 December 2011. Retrieved 23 August 2011. ^ "Williams Supports Jaguar's Return to Racing". 15 December 2015. Retrieved 15 December 2015. Wikimedia Commons has media related to WilliamsF1.